There are countless ways to improve the way you interact with your camera beyond the stock design of the body. Years ago Zacuto USA began the modern market of 3rd party camera attachments, Shoulder Mounts, Follow Focuses, Cages, Handles, and more, but often at prices exceeding your actual camera. "How can I best improve how I use my camera at the lowest cost?" I have found one such product with as a simple solution to improve ergonomics on small cameras that is cheap, useful, and looks cool too. A Hot Shoe Thumb Grip. 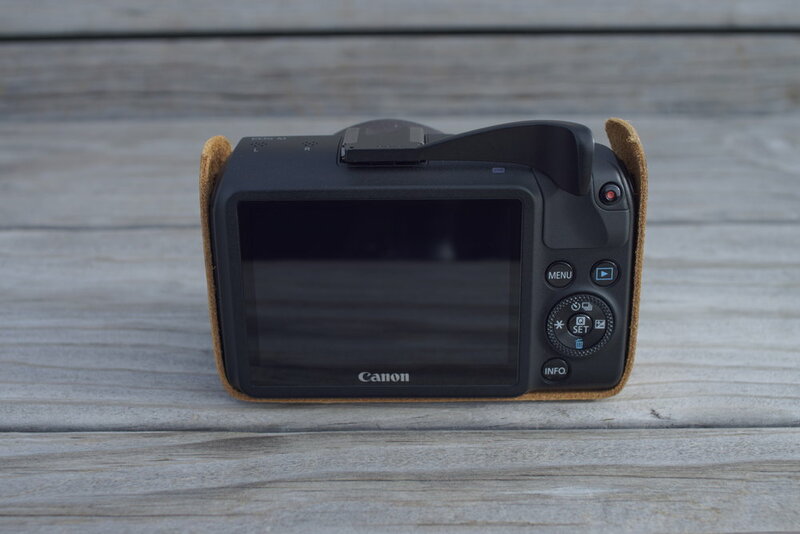 A thumb grip is a $15 rightward metal extension that goes in the hot shoe / cold shoe slot on the top of your camera. It provides an extra/alternative point of contact that is more more stable and often more comfortable. Personally I have one of these for all of my compact cameras. You can browse for your own here, or choose my preferred thumb grip here (read why I recommend this one at the end of the article). 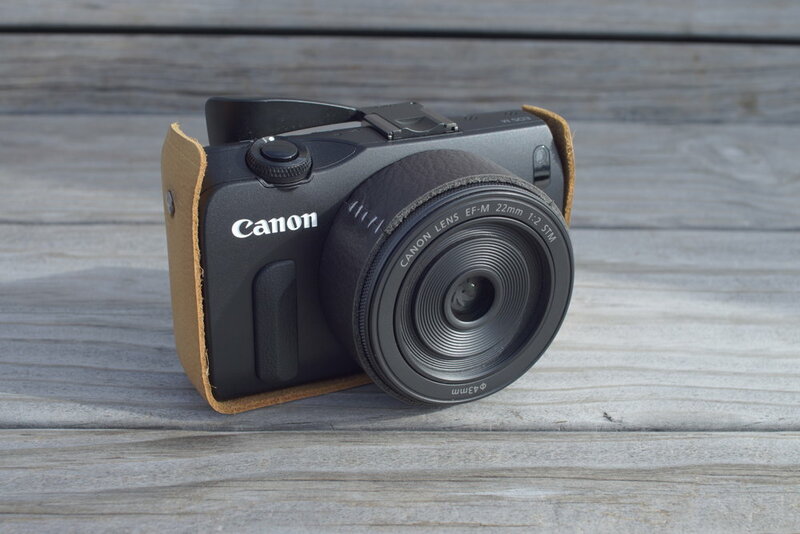 Take a look at how it helps on my EOS M.
The EOS M and many similar cameras such as the Sony RX100 III & Canon G7 X, seem to take design cues from a bar of soap. So having the grip on there enables you to hold the camera beside you easily without the tight squeeze grip usually required. You can also find them in a few different colors and slight differences in style. 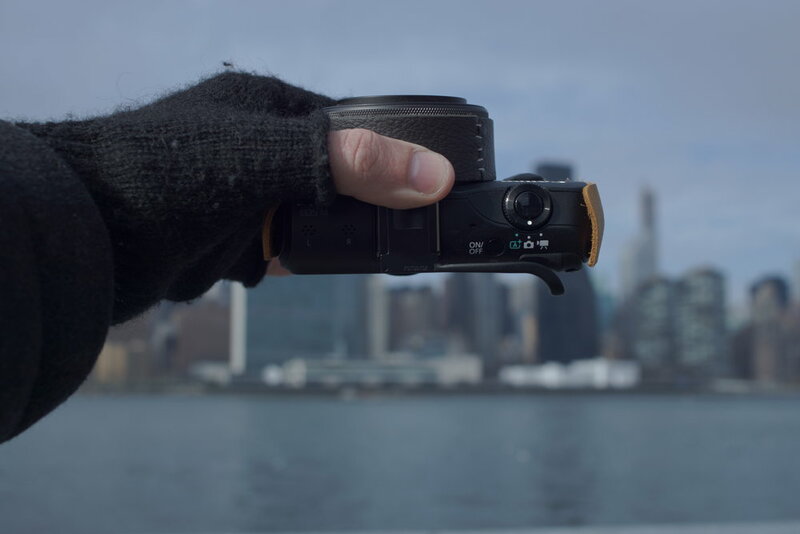 Camera manufactures are not considering allowance for a third party thumb grip attachment when designing cameras, so it may block some functions on some cameras. On my Sony A6000 it prevents the stock pop up flash from opening, but I don't mind as I don't use it. On the EOS M, I have to approach the power button with my finger form the front of he camera, again worth the improvement in ergonomics to me. Make sure you get the longest extending thumb grip you can find! 80% of the thumb grips are the shorter of the two lengths and will likely leave you thumb covering the corner of the screen when you use it. I have the longer grips linked to above. Not for you if you use a flash often. I don't recommend taking this on and off your camera a lot. The grip is very tight in the hot shoe and while safe for the camera, is not easy to remove.